Miss VM (Violetta Maria) Sprules was a teacher at one of the first secretarial schools in London and had as her student, Miss Aristea Glyka (born 1914), who had been educated on the continent and spoke both French and German. When in 1933 Miss Sprules decided to set up on her own, she invited Miss Glyka to join her and they began a secretarial college teaching typing and shorthand. The first school was in Victoria and had five pupils. During the war they evacuated to Oxford and the school had its premises first in an old rectory and then in The Carfax. The school became too large for their Oxford premises and when the lease came up for renewal in the 1960s they decided to move to Winchester because it had a similar 'college' atmosphere. 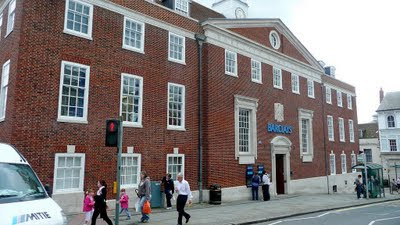 The Barclays Bank building had just been built and they moved to the second and third floors of the chambers above the bank and Ms Iris Rigg and Mrs Eileen Sealey joined them, the school remaining there before moving to Northgate in 1987 when Miss Sprules and Miss Glyka retired to Itchen Abbas, having lived as companions since 1933. Mrs Mary Wood had joined them in 1974 and on their retirement she became the school's principal. The school was sold to St James's of Kensington but bought back and Miss Glyka returned to part-time teaching until it closed in 1994. Their students went into many professions and government offices, particularly the Foreign Office and some even went into the Prime Ministers' office.